India’s decision to make 1,000- and 500-rupee notes worthless (see story above) is having devastating ripple effects in the Indian economy and the market for gold. The consequences of the decision are both appalling and encouraging — appalling because they show governments’ ability to destroy wealth, and encouraging because they show the ingenuity of individuals operating under the thumb of an oppressive government. One immediate consequence is that paper money began trading at a discount to face value. 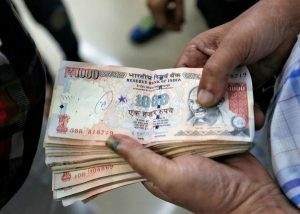 In plain English, you might be able to sell your illegal 1,000-rupee note to a middleman for 750 rupees in smaller denominations. You would get legal tender for your worthless 1,000-rupee note. The middleman presumably has some connection with the banks that allows him to deposit the funds without being harassed by the tax authorities. It’s not unusual for bonds to trade at a discount due to changes in interest rates or credit quality, but this is the first time I’ve ever seen cash trading at a discount (although I did predict this development in Chapter 1 of my new book, The Road to Ruin , released today). The second distortion is that gold is selling in India for over $2,000 per ounce at a time when the world market price is about $1,275 per ounce. This is because Indian citizens are rushing to buy gold for cash. The gold dealers can then deposit the cash for full value. This is just another form of discount on the face value of the cash. It’s not that gold is more valuable; it’s just that your $2,000 is worth only $1,275 (in rupee equivalents) when it comes time to buy the gold. Click here to read how, by Friday, Nov. 11, the entire banking system in India was beginning to run out of cash and alternative forms of payment such as gold and barter were emerging. Don’t think of this as something that happens only in poor countries. Click here to see how similar scenes will play out in the U.S. and Europe as elites become more desperate to take your money.